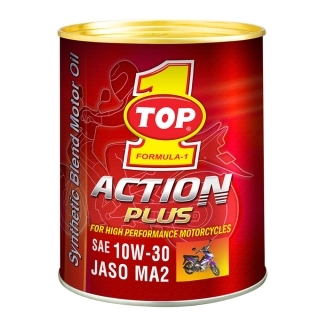 TOP 1 ACTION PLUS is a 4T high performance oil designed to meet the latest motorcycle manufacturers warranty requirements. Specifically formulated to meet the demands of the small displacement high RPM fuel efficient engines found in today's domestic and foreign motorcycles. These engines experience higher operating temperatures and require a motor oil which offers maximum protection against both viscosity and thermal breakdown. The oil is a blend of Synthetic / Hydrocraked premium base oils and special additives which protects against high temperature oxidation, wear, and viscosity breakdown. It is fortified with detergent-dispersants and rust and corrosion inhibitors to keep engines exceptionally clean and free of sludge, varnish and rust. It meets the performance of API SJ, JASO MA2 specification. Meets and exceeds OEMs warranty requirements. and other vital engine surfaces. Exceeds API Service Classification of API SJ, JASO MA2 requirements. Recommended for all types of Motor Cycles.